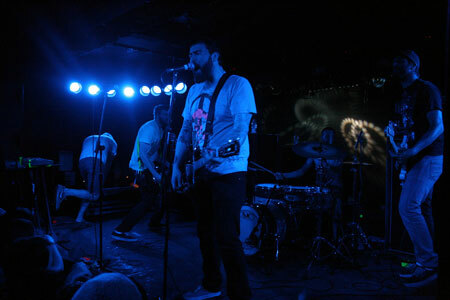 The set kicks off with a hard and fast explosion of gang vocals, crunchy riffage and Four Year Strong’s signature uber long sentence strings that represent some kind of nu school punk rap. The opener “Prepare to be Digitally Manipulated” sets the scene well and definitely adheres to the old adage, “start as you mean to go on”. The band venture between half time and double time, making frequent stops at “massively catchy breakdown central”. Next up is the build up track “The Takeover” leading into the band’s latest single “Bada Bing Wit’ a Pipe”, showcasing not only the band’s impressive technicality but their speedy “to me to you” vocal melodies. The venue is vibrant and positive in regard to the band’s visually impressive, jumping, spinning stage show.